promote our factory and products for professional buyers like Kitchen and bathroom ware distributors & wholesalers, home decor designers and constructors, Cabinet and sink manufacturers, faucets manufacturers(OEM/ODM),as well as water treatment for drinking water companies, you may have our catalogues, but you will get more details as well as new items by sstaps.com. We also have special support for online storer, send email to us to enlarge your business. We sell what we do! We do what we are professional! Suggestions: SUS316 is superior than SUS304 indeed, but the prices are much more higher due to the production costs and techinical difficulties. so unless your living place is or nearby the seacoast, with salty and wet air , there is no need to buy SUS316 for now. but if you have special request, like the faucets might get in touch with salty and wet water frequently, you might probaly need SUS316. Water channel gets no green rust, no more harmful Lead out to the tap water. Satin, Semi-shiny and Shiny surface are available, all these are natural lusters and can be durable with daily cleaning routin. Easy get rid of build-up stains, fingerprints and waterprints. No more ugly oxidization spots or green stains after years use. Secure Payment via Paypal balance or credit card, no need to worry about refund or personal information leakage. you will enjoy a warranty of 5 year from purchasing date on body leakage and all other components. 20 years of stainless steel faucets manufacturing experience. At the beginning of 2000, Italian businessman Fabrizio Zanetta came to Foshan, the famous Chinese plumbing manufacturing city, with a copper faucet sample. He searched the local market and hoped to find a manufacturer that could replace the copper with stainless steel. It seemed to be a mission impossible at that time due to the nature of stainless steel, which is extremely difficult to process and fail. the hopeless Zanetta was introduced a technician Mr Shen ,who was famous in the automobile mold manufacturing industry. He has been engaged in mold casting for more than 20 years in Changchun FAW and Nanhai Automobile Factory and has strong mold development and Manufacturing experience. Mr Shen showed great interest in making faucets with 304 stainless steel, a healthy lead-free material. He went to Mr Kong, who was the founder of the first Simmons production equipment in China as well as the Qianlian Hardware Machinery Factory. They both saw a bright future of it and decided to take over the project from Zanetta. Technically, it faced two major problems: the combination of casting and welding. To solve these problems, the two elderly people,drove a small car, ran through the entire Shuikou Town, bought about 80 sets of copper faucets back and forth, researched and remodeled again and again. the worst was, many new problems were found, such as how to solve pores and sand holes of castings. The material is hard and tough, and the machining is large. Any stainless steel part, even a screw, can’t buy ready-made qualified parts, and they need to solve it on their own. In addition, the welding technology at that time was not mature, and there was no production experience to learn from. What technology was used for welding, how to control the current intensity, how to solve the local overheating deformation…a list of unknown was waiting for them. 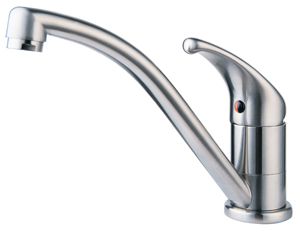 8 months later , 240 days overall, after numerous trial failures, China’s first stainless steel faucet, A-3 kitchen hot and cold mixing faucet, was successfully developed at Huangqi Qinglian Machinery Factory ( Sento former name), and successfully applied for a patent in April 2001 (patent number: CN01235662.X).